Portable Antiquity Collecting and Heritage Issues: Would You Buy A Used car...? 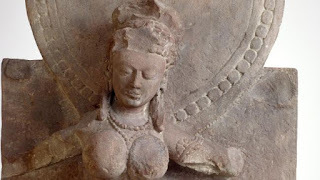 The Weekend Australian has discovered a 140cm-tall red sandstone carving of a mother goddess, Durga slaying the titan Mahisha, bought from New York antiquity dealer Nancy Wiener, is under scrutiny [...] researchers had discovered Wiener sold them the durga without documentation. [...] The AGNSW asked Wiener for more information about the statue but received no response. Nor did she return calls from The Weekend Australian. "Snickers" wrapper and a single loose paper clip in it maybe? Why is it that huge sections of the business of buying and selling antiquities acts today as if it had been in a time-warp in which all the years between the UNESCO Convention of 1970 and the present day had never existed? That is an awfully long time for the "art" world to have its head buried in the sand, only to briefly raise it blinking in bewilderment if somebody starts asking about the documentation of a single artefact. Perhaps the Trustees of the NSW institution will start doing their job and demand of the responsible curatorial staff a detailed and factual report on the state of the documentation of all the gallery's acquisitions since 1970. Where did the objects come from, how did they reach the market? That goes for any public collection that gets caught out for similar misguided Due-Diligence-Deficient acquisition decisions.